Memorial Day Weekend Celebration of Flowers and Food! our front porch and can watch it through the window. The doves and Carolina wrens wake me up at 5 am. I have seen lots of hummingbirds in my yard AND yesterday I had both a yellow and an Eastern black swallowtail nectaring on my Korean lilac. These are the weeks we wait for all year long. Be sure to make the time to get outside and enjoy them. Diane says “they make the garden the most pretty place ever!”. I couldn’t agree more. People arrive in our nursery yard and catch a glimpse of the peonies in the demonstration gardens and off they go to wander the beds. Irises are starting to open, as are the early roses, Baptisias, and classic flowering shrubs such as Weigela. In my own gardens, I delight in the perennials that most people have forgotten- brilliant blue ‘Crater Lake’ Veronica and painted daisies (Tanacaetum coccineum), with long, wiry stems for cutting. One old fashioned flower that self-sows for us here at Natureworks is ‘Angel’s Blush’ rose campion (Lychnis). 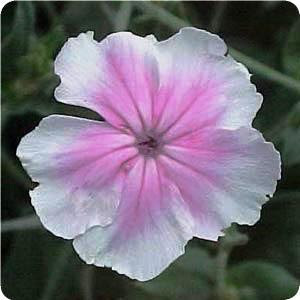 This plant has silvery leaves and white flowers blushed soft pink, thus the name. The more common variety is magenta; this softer version is a real treat. All Lychnis are on sale for one more week, as are our magnificent Clematis vines, all with more buds than you can count… I have been having great luck with purple lupines for the past few years, once I learned not to cut off the flower stalks. Instead I let the seed pods ripen on the plants and bend the stems over when I harvest the seeds. The stems are hollow (just like Delphiniums) and if you cut off their heads, they can fill with water and rot the crowns. Those are my lupines pictured at the top of the email. I am a proud lupine mama. Alliums, bleeding hearts, and peonies in our demonstration gardens this week. Come visit! It’s really pretty right now. I have to thank Jillian Shea, Natureworker extraordinaire, for putting her magic touch on our Incredible Edibles benches after another totally crazy weekend. I spent most of Saturday among the organic veggie seedlings, discussing tomatoes and other edibles with our customers. All of my staff did the same all weekend long. You can only imagine the mixed up jumble that greeted JillianMonday morning. I am happy to report that all the benches have been restocked and reorganized once again, just in time for the “traditionalists” to plant their veggies on Memorial Day weekend. With the extremely warm weather in the forecast, I can finally say the soil and the air will be warm enough, for sure. I am hoping to steal some time myself next Monday to get some edibles into the ground. I have a lot of plants at home but haven’t had much time to work on my own beds in the past few weeks. This Thursday evening I am leading an unscripted ramble, a.k.a. ThursdayEvening Garden Walk, through the gardens from 5-6 pm. There is so much to see and learn right now. Besides worshiping the peonies and irises, I will start explaining pinching and cutting back as many of the plants that will need it are knee high already. 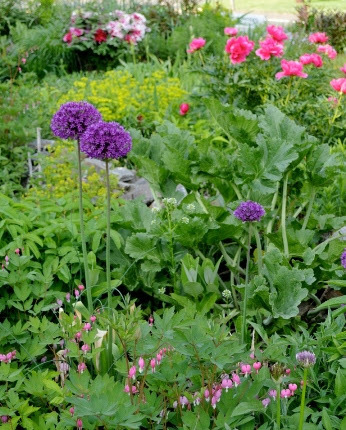 Because my crews have been so busy on assignment, the gardens here are wild and woolly- it will make you feel good to see that these are not perfect flower beds, instead, they are real-life, eclectic combinations of perennials, herbs, and wildflowers. Some combinations we planted, others, Mother Nature planted. It’s truly magical. 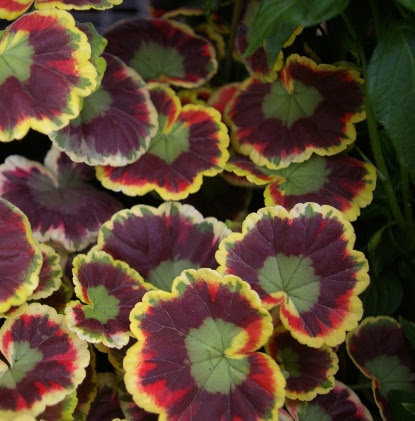 Imagine this variegated geranium in your sunny garden or in a container on your deck. Yes, it has beautiful flowers too…but the leaves are simply amazing. 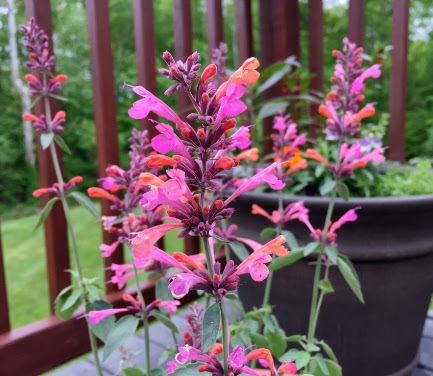 If you only plant ONE new annual in your garden or containers this year, plant Agastache ‘Salmon Pink Bicolor’. This is a hummingbird MAGNET and all parts are edilble (licorice mint). We have many more great colors of Agastache on our benches as well. year. 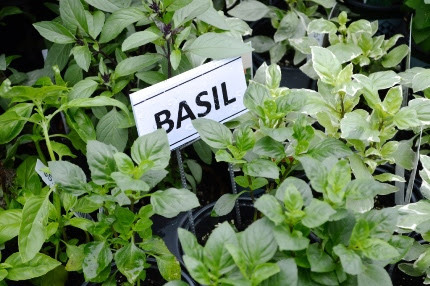 I plan to introduce you to many plants that will take your gardens and containers to the next level. You can add an annual here and there where early bloomers have finished. You can tuck spires of tender Salvias in between clusters of Shasta daisies or coneflowers. As your bulbs foliage fades, fill in the gaps with lantanas, verbenas, Cleome, perhaps some cosmos or snapdragons for cutting. Lure in the hummingbirds with different types of Cupheas and Agastaches. Following the walk, I am teaching my second Playing with Flowers workshop. I have been collecting the sweetest vintage vases for over a year in order to give these workshops. This month I have room for 8 students. 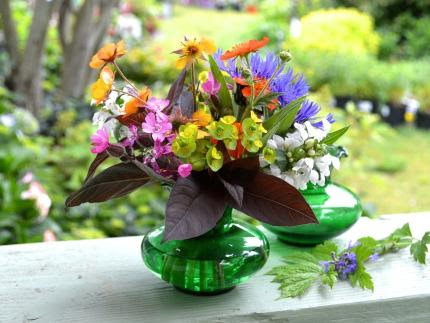 I will bring in flowers from my home gardens and pick from the Natureworks gardens and then teach you how to arrange them in a vintage vase which you will take home, enjoy over the holiday weekend, and hopefully refill with your own garden flowers for years to come. You must register to participate- sign up with a friend. Details below in the Upcoming Events section. I have 9 of these vases that I have collected, one for me and 8 for my students. Join me and learn how to arrange flowers from our gardens this Saturday. Registration details are below. Speaking of the holiday weekend, please note that we are CLOSED onMonday, May 30th, for the Memorial Day holiday. We are probably the ONLY garden center in the state that is closed. My staff works so hard in the spring, and will continue to work really hard all during June. 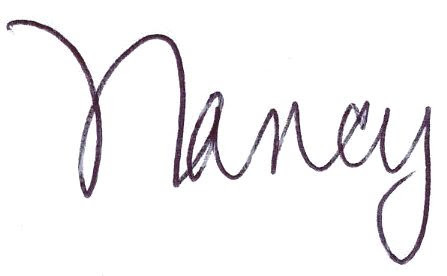 I am happy to give everyone a holiday off to rest and relax with their families. Get your shopping done early- we are open 8 am-7 pm on Thursday, 8-6 on Friday and Saturday, 9-5 on Sunday. What is the finishing touch on every garden? Why, mulch of course. 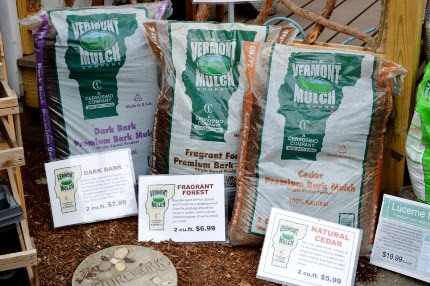 We carry three types of all natural mulch including a dark blend and a soft, fluffy cedar. Of course we NEVER sell dyed mulch. Mulching keeps down the weeds and holds in the moisture. My motto is more plants, less mulch, but the reality is that I still need to spread about 5 yards each year (that’s 68-70 bags) in my own gardens. That’s why not a week goes by that I don’t drive home with my car filled with new plants. Besides more veggies (I have only just begun to plant) I have my eye on a purple columbine, Actaea pachypoda (doll’s eyes) for the shade garden, a couple of bright purple azaleas which I can’t resist, and who knows what else. As a tired, busy landscaper, I don’t get to mulching until after the 4th of July. But YOU can do it now, right after YOU plant your next car load of plants. 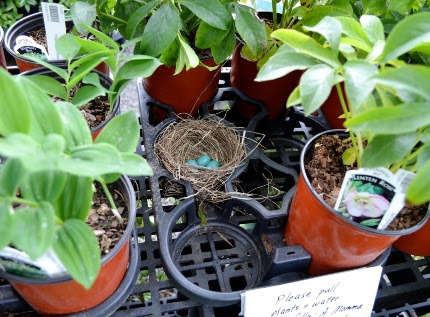 Organic Edibles and Unusual Annuals Galore! Weigela and Boxwood-What do they have in common?